At a published weight of two pounds, thirteen ounces, MSR's 'hyperlight' Carbon Reflex 2-man tent sounds perhaps a little too good to be true. The Carbon Reflex employs a mostly traditional, tent-plus-fly double wall design at a weight typically reserved for single wall or solo shelters. If three pounds sounds too heavy, pitch the Carbon Reflex 2 sans body with fly and optional footprint, and you've got a sub-2 pound shelter. In this elite weight class, the family of ultralight double-wall tents is a small one, populated with some of the outdoor industry's more eccentric relatives. Can the Carbon Reflex tent deliver MSR-brand quality that isn't undermined by the design and durability issues endemic to the superlight category? At first glance, the Carbon Reflex looks very similar to MSR's excellent Hubba Hubba tent. However, the Carbon Reflex is not simply an ultralight version of the Hubba Hubba—it is a separate design employing premium (and expensive) ultralight materials. Unlike the Hubba Hubba, the Carbon Reflex is not free standing. The tent uses only a single longitudinal pole, plus a short crosspole to create an awning. You must be able to stake the tent's body to the ground in order to set it up properly. Also unlike the Hubba Hubba series, the Carbon Reflex has only one entry. As for storage space created by the fly, the entrance side vestibule is smallish but serviceable. Let's call the far-side vestibule vestigial, perhaps large enough to stash a backpack, perhaps not. This decision to make the Carbon Reflex tent asymmetrical proves to be a consequential one. In addition to the loss of a fully functional door and vestibule on the closed side, we also lose the ability to effectively generate a cross-breeze for ventilation when the fly is on—and this is a big loss. The Carbon Reflex's single pole-geometry has a big impact on actual interior space. 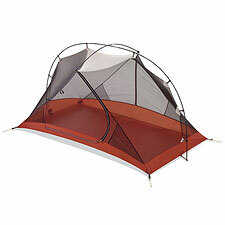 The two-man Carbon Reflex tent is best called cozy for two people. Interior length, in particular, is challenged by the low angle of the walls. There is much reason to celebrate the fact that the Carbon Reflex is a double wall tent, with a fully waterproof rain fly. You can use the Carbon Reflex in the rain with confidence—sort of. As mentioned, the vestibule design limits ventilation. Additionally, the fly just barely covers the body at the ends. In addition to using the Carbon Reflex myself, I also lent it to my hiking partners to get a second opinion during a Mount Williamson hike. Interestingly, one of them, my favorite scientist, immediately pointed out the intersection of the main and cross poles, arguing that it was a structural weak point that needed reinforcement. Despite his insistence that this was an issue, I wasn't overly concerned: tent poles cross all the time, after all. But wouldn't you know it, the scientist was right! Two weeks later I woke up to find the cross pole broken following a night of heavy rain. This could well be an isolated incident. MSR says they've had only a handful of breakage reports, and in any case the poles come with a lifetime warranty. Still, I'd like to see a revision to the crosspole intersection. I'm inclined to be forgiving of the Carbon Reflex's few issues given that it weighs an ultra-low 2 pounds, 11.5 ounces on my scale (tent, fly, poles, and cordage). That's lighter than the single wall Black Diamond HiLight, and basically identical to a FirstLight. But I can't ignore the failure of the cross pole. Additionally, the tent-fly gaps and the lack of a second, fully-functional vestibule are likely to have a significant impact on the tent's real-world performance. A double wall tent is supposed to be superior to single wall designs because you can rely on it in rain and because it will breathe better. But the Carbon Reflex gives these advantages away, to some extent. So my bottom line on the Carbon Reflex is mixed for now. I want to see an update with an true second vestibule and better fly coverage. Give me that and keep the weight under three pounds, and I'll be the first to get in line.